More and more template websites are out there to help the busy creative artist. To most people they symbolize a sort of short-cut to getting a project done. To the lazy, they are an easy path to not having to use the right half of your brain. 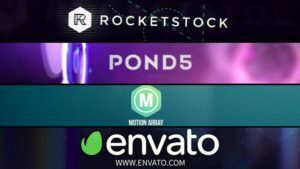 But when it comes to Motion Graphic Templates (typically in After Effects), this could possibly cause more work for you than you think. The best looking templates are not always the best assembled templates. The problem is, some templates are put together by 1 or 2 people, and those are usually the ones that have the least problems with the assembly. However, some are put together by teams of people working for companies that just crank these suckers out. And in many cases, several people could be assigned to one project. One composition could have as many as 5 or 6 sub-comps, making it difficult to navigate through the tangled mess, as well as make specific modifications. Usually, those type of templates are best used “out of the box”. In other words, if you want your video to look exactly like the demo (with the exception of the images and logos used), then they might work just fine. But don’t expect to modify them very easily. Others will work just fine if you want to customize it and kind of use it as a base starting point. So how can you tell before you buy them? Well, unless you get familiar with the developer and their style of creating the templates, the answer is – you can’t. And usually you will end up $50-$60 in the hole before you find out. Not very practical. If you are a motion graphics artist and you are reading this, you are either shaking your head in agreement or asking yourself “Well, what am I supposed to do then? How can I take advantage of using templates that look so appealing?” I’ll give you my advice, but it’s not something you are going to like. Are you ready? Here goes… Get better at using After Effects (or Motion). “What?” (you say). What I mean is, when you go to choose a template, never expect to use that template 100%. And if you need an element from that video (like an effect or a custom camera movement or look and feel), then great. By all means get the template. But again I warn you, after you buy the template, it’s very possible that in order to get the achieved look and feel you are after (based on the preview), you may have to do even MORE customizing than you planned. So… get better at the software so if and when that happens, you will know exactly what to do. And as an added bonus, you might start to rely less and less on the templates in the first place. Now there’s some solid advice. Hey, I did warn you that you were probably NOT going to like it. Please don’t take this to mean that you should stay away from templates altogether, I just wanted you to know what you were getting into before you make the investment to begin with. There is a happy ending to this. Any company or person who needs a video produced who thinks they can just buy a copy of After Effects and then buy a template to get the finished product they want in order to save a whole lot of money is probably going to get very frustrated very quickly and soon call in an expert to do the job. So in the end, having the templates out there to begin with is not necessarily taking money out of your pockets. And if you get good enough at working with them, it could actually put more money IN your pockets! ‹ Internal Communications v/s Human Resources: Are they the same?